This article is written in association with Chris Hull from Active Academy. Chris is an LTA tennis coach and fitness instructor with a particular interest in sports-specific rehabilitation following tennis injuries. Tennis players who struggle with persistent elbow pain should take a good look at their equipment – it could be the main culprit! 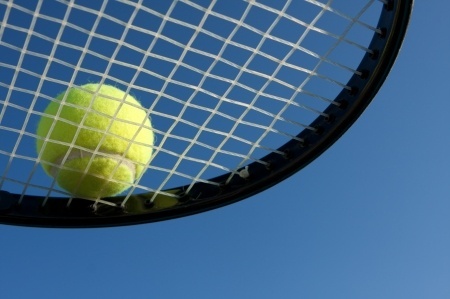 Why does playing tennis predispose you to tennis elbow? Newton’s third law says that for every action there is an equal and opposite reaction. When applied to a tennis shot, this means that you may think that you are hitting the ball, but the ball is also hitting you (or at least your racquet). You and the racquet are much heavier than the ball, so it’s the ball which changes direction the most (Newton’s second law: force=mass x acceleration). However the ball does still apply a force to your racquet, trying to push it backwards or twist it in your hand. This force has to be countered by your arm muscles, and in particular by those in your forearm which are responsible for a strong and stable grip (the ECRB and common extensors especially). The more off-centre your contact point, the more torque is generated and the more your racquet is twisted in your hand. This happens many times during a tennis match. Over time, this repeated micro-trauma can result in injury to these tendons, culminating in tennis elbow. 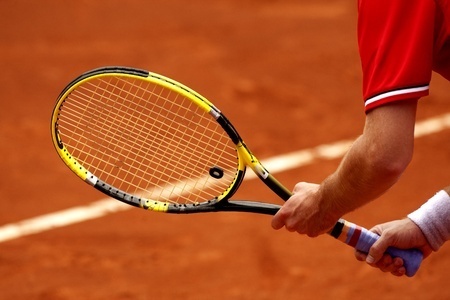 Modern tennis racquets are light years from the old wooden models of 30 years ago. They are larger, lighter and stiffer, which is great for your game, but unfortunately less so for your elbow. The same is true of many modern high performance tennis strings. You might think that a larger tennis racquet with a wider string area would protect your elbow from pain and injury by absorbing the impact. However this is not necessarily true. Although bigger racquets have a larger sweet-spot, there is more potential to make contact with the ball further from the centre of the head, which will tend to rotate the racquet in your hand. This torque has to be resisted by your forearm muscles (ECRB and common extensors) and therefore by their tendons on the outside of the elbow. We are not suggesting that everyone should use a very small racquet like Roger Federer, but beware those super-sized tennis power racquets. This is also somewhat counter-intuitive. Many recreational tennis players like a lighter racquet because it generally seems more comfortable and is easier to control and swing. However as described above, every time you play a shot, your racquet and your arm have to resist the impact from the tennis ball. Newton’s second law says that force equals mass times acceleration. In this situation, the mass is provided by your racquet head and the acceleration by your arm muscles and the strings. A lighter racquet therefore means that your forearm muscles have to work harder to resist the impact of the tennis ball, increasing the risk of pain and injury. Conversely a heavier racquet may take more effort to swing, but has more momentum when it strikes the tennis ball meaning that there is less strain on the forearm muscles and tendons from the impact and less risk of elbow pain. Of course not everyone has the physique to play tennis with the racquets used by many of the professionals. In fact they often add lead-tape to the head in order to give their shots even more weight. Too heavy a tennis racquet can result in fatigue and poor technique which may also cause pain and injury. However if you normally play with a very light racquet and have problems with elbow pain, a heavier racquet is worth considering. Modern carbon-fibre racquets are much stiffer than the old wooden ones. Racquet stiffness is usually measured on the RA scale with most modern racquets scoring somewhere between 60 and 75 (higher is stiffer). 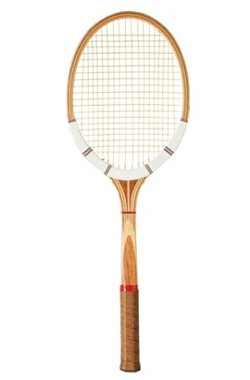 Wooden racquets went as low as 20. Stiffer racquets dissipate less energy at impact, which generally means more power to the shot but also more vibration to your elbow. You should therefore consider a tennis racquet with a lower stiffness rating (low 60s) if you are prone to elbow pain. A grip which is too large or too small will force you to grip harder to resist any torque on the racquet, increasing the risk of elbow pain. If your grip is the correct size, you should be able to just insert your opposite index finger between your finger tips and the pad of your thumb when gripping the racquet. Putting it all together – which racquet for tennis elbow sufferers? As one moves from group 1 to group 3, racquets generally become smaller, heavier, and less stiff. It would therefore seem that players with tennis elbow should use a control racquet, but sadly it isn’t that simple. 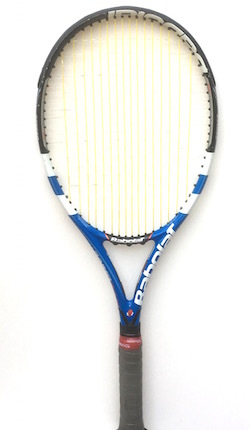 Control racquets are generally aimed at advanced players who generate all their own power but need maximum control. They are harder to play with and generally much less forgiving, not ideal for the average amateur player. In fact playing with a racquet which is too small and too heavy is likely to lead to muscle fatigue and poor technique which may actually increase the risk of elbow pain and injury. A compromise is therefore necessary. We would suggest that you take a look at the attributes of the racquet you are playing with, discuss it with your coach, and try something slightly heavier and more flexible. If you are using a racquet with a very large head, try something smaller, but avoid the extremes. These all affect the stiffness of the string bed and therefore the amount of impact and vibration transmitted to your arm. In general terms, more stiffness means less power, more control, and more tennis elbow. 1 and 2 are fairly straightforward: if you are a tennis player who is prone to elbow pain, try decreasing your string tension and maybe using a thinner string. However string material warrants further explanation. Here is a link to a brief guide to the different types of tennis strings. Players with tennis elbow should generally opt for the softer “comfort” strings such as natural gut, synthetic gut, or particularly one of the modern multifilaments. Examples of the latter include Wilson NXT, Wilson Sensation, Babolat Xcel, and Technifibre NRG. Steer clear of the monofilaments and especially kevlar. If you really must have a monofilament, then use it as a hybrid with a softer multifilament in the crosses. This will give you the best of both worlds and is actually the choice of many of the professionals including Djokovic and Murray. The softer strings do tend to break a little more frequently, but it is a lot easier to treat a broken string than a damaged tendon! And finally, tennis elbow suffers should avoid playing with wet balls. They are heavier and will therefore generate more force on your racquet at impact. Posted in Elbow Problems, Tennis elbow.